JOIN OUR 352,717 MEMBERS AND GET INSTANT FREE ACCESS TO DOZENS OF VIDEOS! Determining whether you are right or left hand dominant in your putting stroke is one of the most important aspects to rolling the ball like a pro. In this video, Chuck Quinton discusses the importance of monitoring the putter face angle through impact with the dominant hand in order to start your putts online. This is very critical when trying to make those 8 and 10 footers for par and is something the Tour Pros excel at. In fact, the greatest golfer of all time, Tiger Woods, has talked about how he uses his right hand in his putting stroke to control the putter. As we all know, Tiger is perhaps the best ever at making those clutch 6 footers for par when the tournament is on the line and he could never do this without understanding the relationship of the putter face and ball at impact and how to use his dominant hand to control it. As you'll learn in this video, the ball will leave at nearly exactly 90 degrees to the putter face angle at impact. On a 10 foot putt, being off only 2 degrees can cause you to completely miss the hole. Because we are putting on a slight arc, the putter face should technically be slightly open and working its way closed through impact, but this is a very slight amount of only 1 degree or less. Learning which is your dominant hand in your putting stroke will allow you to monitor the face angle throughout the stroke and ensure that you are square or very close at impact and get you rolling the ball on your intended target line in just a couple minutes of practice. Once you use the simple drill in this video to determine which hand dominant you are, you may need to make changes that allow you to better control the putter face throughout the stroke. There are key aspects to how you take your address position depending on whether you are right or left hand dominant. In the table below is a breakdown for each trait. If you are left hand dominant, are you putting with the proper setup and grip? Putting is one of the simplest mechanical strokes that we make in playing a round of golf, but it's one of those things where people don't really feel confident that they know what to do or how to do it. They don't understand how to release the putter, how the putter is designed to work. It's sad, because there's no other aspect of the game where you can save more strokes off your handicap than with the putter. It's the great equalizer in the game of golf. You don't have to hit 300-yard drives. You can hit it 220 and still get up and down and save par more often than not, if you understand what it takes to become a great putter. In this upcoming Putting series, we're going to talk about the key things that are going to make you a much, much better putter, a more consistent putter, and you're going to start looking at those 20- and 30-footers, salivating over them, where you're excited to make them, because you know that you've got a very, very good chance of making them. The key aspect that we're talking about today is which hand dominant are you? That might sound interesting because, as an instructor, you hear very often from me that I don't want the hands very involved in the stroke. I want them to be passive, and so on and so forth. That hasn't changed. What changes is your perception of the putting stroke; how you think about how you roll the ball, how you control the putter, and how you're going to make more putts. What we're going to talk about today is a little test. I want you to grab a putter if you have one on you, and we're going to make some strokes here. You're going to hit some putts, so you're going to need a ball and a putter to do this test. You're going to see which hand dominant you are. That might sound interesting because obviously you know that I want this stroke to be controlled with the big muscles, with the shoulders. We want a nice, smooth rocking motion of the shoulders, back and through. But what you have to understand is that the most important aspect for amateurs to get right in the putting stroke is not speed, as you hear so many professionals talk about - speed's very important, don't get me wrong - but the most important aspect is controlling the putter face angle. What I mean by that is obviously, when you're looking at the putter face, it's perpendicular to the target. Your goal is to line that up at 90 degrees, or directly face on, to the intended line that you want the ball to start on. What's important to understand, when you think about ball striking, people's path is often a little in-to-out or out-to-in, and the face alignment can be off a little bit there. Because you're trying to hit a very large target, a green that's 20-30 yards wide, precision is not nearly to the same degree when you're trying to make a putt going in a 4.5" cup. What you have to understand is that when you're striking a ball, not only is your target much wider, much bigger, but there's also another force at work when you're striking a golf ball with an iron shot; that the ball will actually compress on the face. What this will do is allow you to manipulate flight a bit, and in terms of accuracy it allows you to cheat a little bit because the ball will come off close to 90 degrees to the club face angle, but not exactly. There's a little bit of leeway there, and again because you're using a bigger target you're not trying to get as precise. With the putter, because the ball doesn't compress on the face - because you're not hitting it as hard you don't get a great deal of compression; you can get a little bit, but it's very minute - it's very, very important that you understand that that ball will always leave at 90 degrees to the face angle of your putter. Now, you may have a poor stroke. You may loop it inside and come over, and your path might be off. Hopefully you're using the putting plane, because it's a great training aid to help get your stroke lined up, but even using the putting plane device, your face angle can still be off because you may not realize what you're doing with the face angle. What we're going to talk about today is how you begin to perceive how to control that putter face. Again, to reiterate, the most important aspect for you to get right is having that putter face being square or slightly - we're talking a tiny, tiny amount, less than a degree - slightly open at impact and closing through impact, but what you're going to feel is it's going to be very, very square at impact. You may have a really, really great stroke; a great plane, a great path for your putter head, but if that putter face is closed just a degree or two at impact, that ball is going to leave left of the target, and on a 10-foot putt you're going to miss, so it's very important that you learn to control the putter face, and stroke the ball. Your path can be a little bit off, but the face angle has to be as precise as you can possibly achieve on a consistent basis. Here's how we do that. As you know, we're taking a grip that neutralizes our hands, so we're not dominating the stroke. When we're talking about being left hand or right hand dominant, we're not talking about which wrist do you flip and break down through the stroke. We're still using our big muscles. We're still connected, we're still rocking our shoulders back and through, but as we're doing this the putter face angle is being monitored by one hand or the other. This is a key aspect to understand, so here comes the test. Take your putter and take just one hand. Start with your left hand, and I want you just to hit putts with your left hand. Hit 10 or 15 putts, say 5-10 feet, and see how many you make. Pay attention to which one allows you to get the most consistent roll, in terms of deviation. You're not going to make, necessarily, every putt. You might, but see which one gets you the closest to the hole every time, gives you the best control and feel for speed, but more importantly which one starts the ball on line and rolls the ball the most true and the most accurate toward your target? Hit 10 or 15 putts with your left hand and keep track to see which one you're able to control the face the best with. Then go back and hit 10 or 15 more putts with the opposite hand. Now you're going to take your right hand, take your same grip and make your same stroke, but just with your right hand. Most of you will find that you will hit better putts with your right hand than you will with your left. That's because most of us are right handed, and we're right hand dominant. If you're left hand dominant, that doesn't mean that your stroke is bad or that you're doing something wrong, but it does mean that you need to make some changes in how you putt. If you found that you rolled the ball really well, really consistent, with that left hand, there are two things you need to consider in your setup and your putting stroke. First, my suggestion, the best solution, is that you putt left hand low, that you take your left hand and get it below, so that your left arm is more in alignment, in a straight line. Your right arm will be bent now, and you're going to more or less control that putter face more with your left hand and left arm, and your stroke is going to be a little bit more left side-feeling dominant, because you're monitoring that putter face with your left hand. Again, we've got to get that putter face square at impact, or very, very close to being square on a consistent basis. If you don't want to putt left hand low because you struggle to control the speed - the line is good but a lot of people can't control the speed very well - you can still putt with your left hand in a conventional grip. However, it's important that you try and achieve a proper alignment of that left arm. When I mean by "proper alignment" is I want a proper extension from the shoulder down through the hand to be straight. The opposite of that would be my elbow is bent and my wrist is bent, which is what you're going to find in a conventional putting grip, that your left elbow is going to be bent and your left wrist is going to have a little bit of bend in it. As a left hand dominant putter, we don't want that. We want our left arm to be in alignment because it's easier to control and keep these joints from breaking down. In order to fix that, what you need to do is get a little bit of tilt behind the ball with your spine, or your axis. You're going to get your left hand a little bit more forward. Now you can see that I've got a pretty nice alignment between my left arm, the shaft, my wrist, my shoulder. Now it's easy for me to keep the stroke feeling like I'm controlling it more with my left hand than with my right. You'll see somebody like Phil Mickelson. He's a putter who putts - he's a lefty, obviously - but he's doing it with his right hand because he's controlling it more with his right hand. He's got those alignments set up, so two different ways to putt better, if you're left hand dominant. Now if you're right hand dominant, which most of you will be, you're going to find that you can take a normal putting grip, your same putting grip that you were using when you were hitting just one-handed putts. Now all you have to do is bring your left hand on, and you've got the exact same setup that you had before. If you can putt just like this, right hand dominant, monitor the face with your right hand, you'll be able to make more putts. Take time to learn which hand you're most comfortable with, you're most confident with, right hand or left hand. Then make adjustments with your stroke and make sure that you're monitoring that putter face angle as you go back and through, with your dominant hand. This is going to give you more coordination. You're going to have more confidence that you're starting the ball on line. You're going to know that you can send it at your target. I'm not telling you to use your hands. I'm telling you to monitor the putter face with your dominant hand, and I guarantee you'll make more putts. Join our 352,717 members to watch this video and 350+ more! 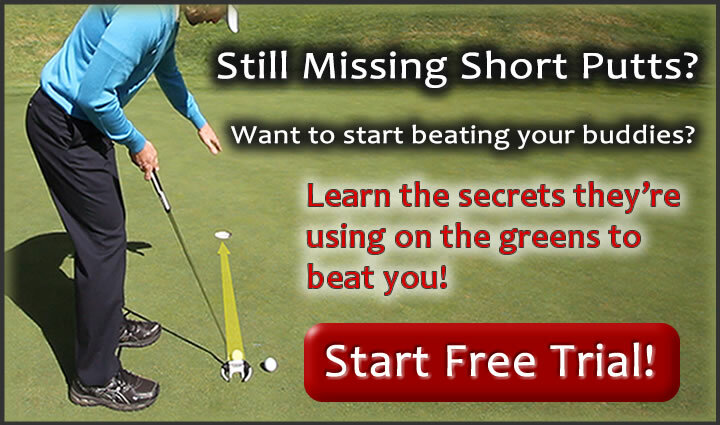 Get Your Free Membership to Watch "How to Putt - Hand Dominance" Right Now! Join our 352,717 members to watch this video and 100+ more!